In this page we will provide Spring MVC XmlViewResolver example with JstlView and RedirectView. XmlViewResolver handles views defined in XML. This helps to achieve view definition in a separate XML file that we can put at our required location. We need to refer this location in XmlViewResolver using setLocation() method. 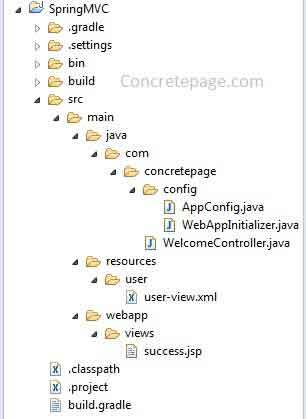 In our example, we using java configuration file to create the bean of XmlViewResolver . Find the complete example. We need to create an XML file at our required location and define the URL using JstlView and RedirectView. JstlView : The view which uses JSP standard tag library (JSTL). RedirectView : The view that redirects the absolute or context relative URL. Find the XML view used in our demo. We have created here a XML view for user. There are two bean definitions, one for JstlView and second for RedirectView . When the controller method returns the bean name as string, then corresponding URL is invoked. Suppose that controller method return success value, the corresponding bean will be invoked and the URL /views/success.jsp will respond. In the same way for home value, the absolute URL http://concretepage.com will open. According to our requirement, we can use one or more combination of JstlView and RedirectView in our XML view. XmlViewResolver uses an XML file as view definition in which we define inner and external URLs with the help of JstlView and RedirectView. Default XML file location is "/WEB-INF/views.xml". But we can assign any location. To configure view location, XmlViewResolver provides XmlViewResolver.setLocation() method. Find the definition of XmlViewResolver. Find the JSP used in our demo. To test the application, download code and run gradle as gradle clean build. Deploy war file in tomcat. 1. Find the URL to test JstlView. 2. Find the URL to test RedirectView. As an output http://www.concretepage.com/ will open.